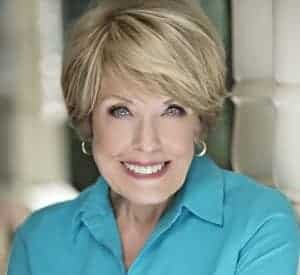 Before I get to an answer for Joan, let’s talk generally about wood floors and the difference between a painted wood floor and a finished wood floor. I would never suggest that anyone treat them as equals when it comes to cleaning. Please, make sure you never use a painted floor cleaning formula on your finished hardwood floor because it will be too harsh and could cause damage. Paint by definition is different than say a polyurethane finish, typically used on hardwood floors. 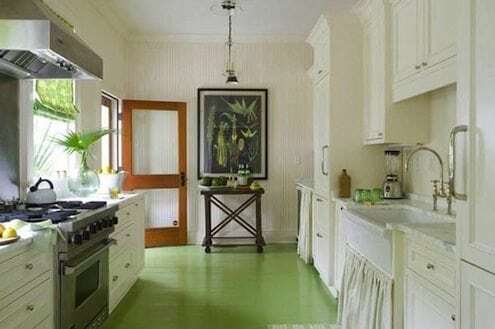 Paint is tougher, especially latex enamel that has been formulated for wood floors. Although water isn’t recommended for cleaning finished wood floors because it raises the grain, it’s safer for painted floors because the paint prevents the moisture from soaking into the wood. 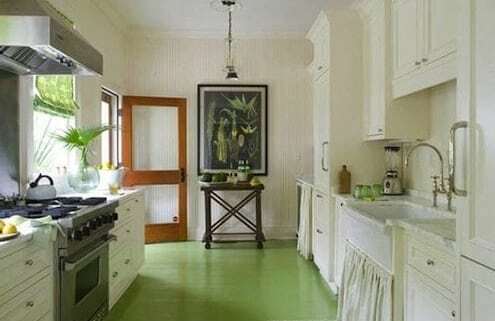 Even so, Joan will want to dry her painted wood floor promptly to prevent the wood from absorbing moisture. Because Joan used the word “grimy” to describe this painted floor, I’m going to assume this painted floor that has dried on spills and dirt that’s been ground in over a period of time—a worst case scenario. STEP 1. Using a stiff bristle broom, thoroughly sweep the floor to loosen and remove as much debris as possible. STEP 2. Vacuum the floor using the hard surface setting or attachment. If there are cracks between the boards, use the crevice tool to remove all of that dirt and debris. STEP 3. Mix up a batch of Painted Floor Cleaner: Add the following carefully measured ingredients to a one-gallon container: 4 teaspoons super washing soda (different than baking soda); 5 tablespoons borax; 4 teaspoons blue Dawn liquid. Fill to within an inch of the top of the container with hot water. 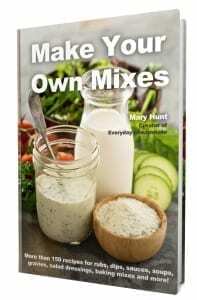 Mix gently until all ingredients are incorporated. STEP 4. Test this cleaner in an inconspicuous place of the painted floor (like in a closet, behind a door) to make it does not cause any harm to the paint, especially if the paint is old cracking, brittle or even beginning to chip or flake off. STEP 5. Fill a spray bottle with the cleaner, or pour into a mop bucket depending on how you wish to clean the floor—on your hands and knees with a rag, stiff brush or sponge or using a good strong floor mop. Either way, work in small areas—spraying or mopping a small area at a time, scrubbing until clean. STEP 6. Fill a bucket with clear water. Rinse the mop if you’ve been using one, or get a clean one. Mop the floor a second time with the clear water to remove all cleaning residue. STEP 7. Dry the floor immediately with a clean, dry towel. Drying by hand prevents streaks and collects any remaining dirt left on the floor. Super Washing Soda: This is a specific product from the Arm & Hammer company that is very different from baking soda, typically available in the laundry aisle of stores like Target and Walmart, or you can get it online. It is also known as soda ash when used in swimming pools to manage ph balance. Washing soda is powerful against dirt, but can be harmful to some surfaces like fiberglass, acrylic and even painted surfaced if used to make a very strong solution. In the Painted Floor Cleaner formula, the washing soda is greatly diluted but still powerful. It should do no harm. Still, you need to test it. Borax: Sold most often under the name 20 Mule Team Borax, you’ll find this in the laundry aisle, often in supermarkets. Blue Dawn: This liquid dishwashing detergent is a remarkable product that we use in just about all of our cleaning products. Any version (ultra, original etc.) is what you want as long as it’s blue and the brand name is Dawn. If you’ve been following for very long, you’ll recognize these ingredients as very similar to our Homemade Laundry Detergent. They are, but in very different quantities. Please DO NOT use your batch of Homemade Laundry Detergent to clean your floors. It is way too harsh and you will not be happy. SMALL BATCH: If you would rather make up a much smaller batch of Painted Wood Floor Cleaner that you can mix in a spray bottle, I’ve done the math: 1/2 teaspoon washing soda, 2 teaspoons borax, 1/2 teaspoon blue Dawn and 2 cups hot water.